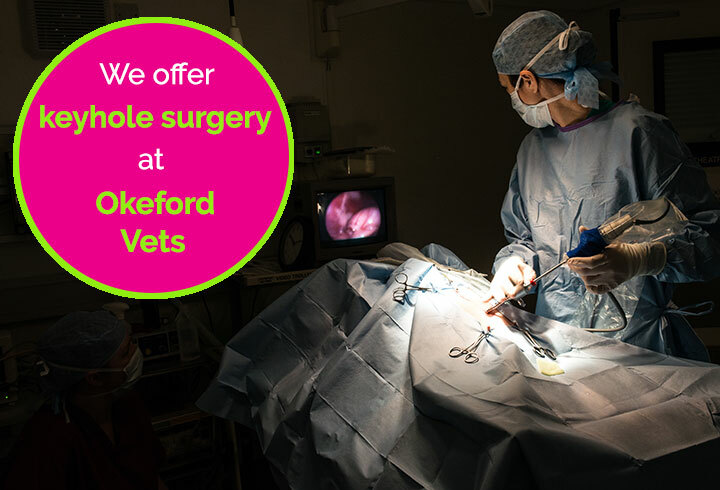 Here at Okeford Veterinary Centre we are proud to offer keyhole surgery. Laparoscopic or keyhole procedures have been performed on humans for many years and have significant benefits over traditional open surgeries. Neutering is recommended to avoid unwanted pregnancies and reduce the risk of some cancers and womb infections. In contrast with traditional neutering, keyhole surgery is a much safer, less invasive method carried out through two or three small incisions rather than one large incision in the abdomen. A camera and long, thin, surgical instruments are used inside the body cavity allowing precise surgical procedures to be carried out with minimal trauma. Only the ovaries are removed which shortens surgical time with no adverse effects on long term outcome. If you are interested in further information regarding laparoscopic procedures or would like to find out about booking an appointment for your pet, please call us on 01837 52148.